This recipe is so quick and so simple. The semisweet fudge base has only 2 main ingredients, chocolate and a can of sweetened condensed milk. I like to add a little butter, salt and vanilla for extra flavor but it can also be made with out them for a 2 ingredient fudge! Now, making a classic fudge can be very tricky. It requires a candy thermometer and is a very delicate recipe that requires your full attention and can take up to 45 min. to prepare. It is usually made by mixing sugar, butter, and milk and heating it to what is known as the "soft-ball stage" in candy making, followed by beating the mixture to cool it to the perfect temperature. This can be difficult for beginners and very time consuming perfecting the perfect texture and appearance. But... 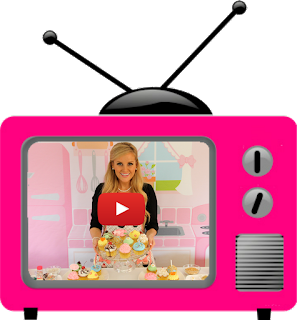 If you read my blog, you know I always try to come up with a shortcut to all of your favorite desserts and confections. So here's a simple alternative recipe, for those who simply can't wait to sink their teeth into something rich, creamy, and decadent. These little fudge bites are so easy to make and so versatile. You can use any type of chocolate you like, from dark to white. Even spike them with liquor for a fun adult twist! 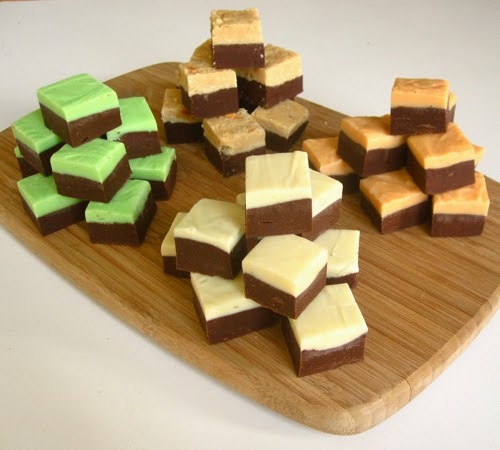 You can cut the traditional squares of fudge, or pour it into cupcake liners (I used mini ones) for perfectly portioned, self-packaging, bite-sized pieces. These are also great to make for parties, work/school, or to give out as gifts because they can be served and packages up so easily for a perfect little treat. *You can use 4 cup (24 oz.) white or milk instead and omit the butter for a white chocolate fudge. Note that using white or milk chocolate will result in a less firm fudge compared to a semisweet based fudge. Mix-ins: Add 1/2-3/4 cup ingredient of your choice, such as chopped nuts or candies, marshmallows (frozen to prevent melting), shredded coconut, Oreo cookie pieces, rainbow sprinkles, pretzels, M&Ms/Reese's Pieces, toffee, dried cranberries/cherries, crushed peppermints, rice krispies, etc. Flavorings: Add 1-2 teaspoons extract of your choice OR 1 (3.4 oz) box instant pudding mix in flavor of your choice (strawberry, maple, banana, orange, coconut, orange, etc). Garnish as desired. Mint Chocolate Fudge: Add 1/4 cup crushed peppermint candies OR 1-2 teaspoons peppermint extract. Top with peppermint candy pieces. Chocolate Peanut Butter Fudge: Add 3/4 cup smooth or crunchy peanut butter. Top with peanuts. S'mores Fudge: Add 1 cup frozen (to prevent melting) mini marshmallows and 1 cup Golden Graham cereal or chopped graham crackers. Chocolate Banana Nut Fudge: Add 1/2 cup chopped peanuts and 1 (3.4 oz) box instant banana cream pudding mix. Mocha Fudge: Add 1 tablespoon espresso powder. Top with chocolate covered espresso beans. Rocky Road Fudge: Add 1/2 cup chopped nuts and 1/2 cup frozen (to prevent melting) mini marshmallows. Chocolate Orange Fudge: Add 2 teaspoons finely grated orange peel. Top with orange candy slices or candied orange peel. Chocolate Caramel Pretzel Fudge: Add 1/2 cup chopped pretzel twists and 1/2 cup chopped and frozen (to prevent melting) caramel chew candies. Almond Joy Fudge: Add 1 cup sweetened shredded coconut and 1/2 cup chopped almonds. Chocolate Cherry Fudge: Add 1/2 cup dried cherries. Confetti Fudge: Add 1/2 cup rainbow sprinkles. Red Hot Fudge: Add 1/2 cup crushed red hot candies. Heat chocolate, sweetened condensed milk, butter and salt in the top of a double boiler or microwave until all of the chocolate is almost melted. Remove from heat and stir until smooth and completely melted. Stir in vanilla extract and any desired mix-ins or flavor variations above. Spread evenly into prepared pan and chill in the refrigerator for 2 hours or until firm. Remove from pan by lifting the wax paper up. Cut into squares and serve. For easy cutting, dip a sharp knife into hot water, pat with a towel and slice.